My best friend, Sheila, asked if I could make cakes for the Christmas party of the company, IDEAL PROPERTIES (理想地產), of her husband, Sam Wu. This is a realty/property management company that has been long established in San Gabriel Valley. I remember seeing their signs even before I was married, and their office used to be in Montery Park, but has now moved to a more convenient location in Alhambra, at 625 E Main Street, (626)-289-8888 begin_of_the_skype_highlighting (626)-289-8888 end_of_the_skype_highlighting. I have used their services for my family's real property needs even before Sheila and I became good friends! 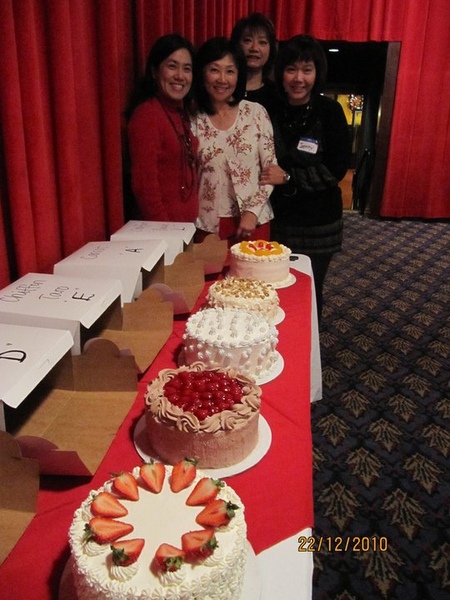 I was very glad to have this opportunity to serve them in return by making them the party cakes. Sam, the big boss of the company, wanted to try different flavors of my cakes, and wanted to have them spelled out IDEAL for decorations. (Well, I actually "failed" on the decoration challenge this time, sigh...) Yes, all cake orders are challenges to me! Can I do this? Can I meet the needs of my clients? Well, if I had more time... I could have made it the way Sam wanted it. Anyway, sorry, Sam and Sheila! Next year! I have already got ideas on a perfect cake for the occasion. 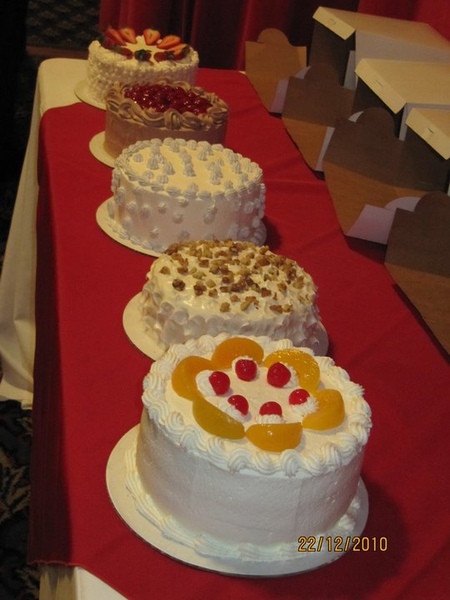 All five cakes are different in flavor: Chocolate with Strawberry Whipped Cream, Black Forest, Chiffon with Taro Mousse, Carrot cake, Chiffon with Peach Whipped Cream. It was a challenge to make them all in one day! I actually messed up on the amount of sugar when baking the chocolate cakes, and had to whip up a second batch! Speechless! The peach cake was decorated in a more traditional way. The chiffon with taro mousse was the same from the Mai Am party, except that this time the decoration is really whimsical. I had fun making it, and I really like the way it looks! The black forest has the traditional look, too; at least this is what I remembered when I first had it in UCLA cafeteria. It was with black cherries, but I don't always find them in markets, and the sour cherry filling seems to be well received, too! The chocolate strawberry cake was supposed to have a chocolate top as a backfrop to showcase the strawberry, but it did not work, the chocolate... :-( But, the sides with stars all around is really pretty! Front to back: Chocolate Cake with Strawberry Whipped Cream, Black Forest Cake, Chiffon Cake with Taro Mousse, Carrot Cake, and Chiffon Cake with Peach Whipped Cream. Left to right: Christine, me, Sheila and Jenny.